This Feiss Regent Court 1 light small outdoor wall lantern in walnut finish with rippled glass panels and rated IP44 is traditional and elegant. 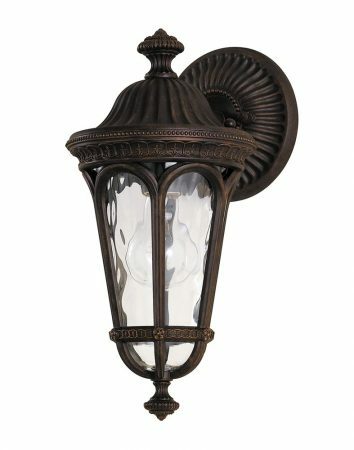 Detailed cameo wall mount with decorative scalloped rim and curved over-arching arm supporting a small hanging lantern. The lantern features a detailed top finial, ridged sloping roof and tapered lantern, with cathedral style windows fitted with hand-made water glass and lower finial. This exterior light is supplied by Elstead Lighting and designed in the USA by Feiss, founded in New York in 1955. They have become well known over the years for their contemporary yet classic styling, quality and great original designs like the Regent Court 1 light small outdoor wall lantern in walnut finish with rippled glass panels and rated IP44 you see here.